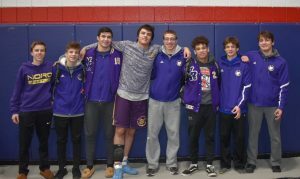 High caliber teams from Northeast Ohio and across the State made the wintry trek north to Austintown Fitch High School on January 25th and 26th, where the North Royalton Bear’s wrestling team put together one of their best performances in over a decade. The Bears brought an impressive seven wrestlers into the Championship rounds of the 26th Annual Josh Hephner Memorial Wrestling Tournament. 152 lb. senior standout Paul Twarog once again out-matched his opponents, eight in total, on the weekend, to take home the bracket. Lazar Gasic, returning to action after recovering from injury, eased back into wrestling action to bring home an impressive Bronze medal at 220 lbs. Wrestling Friday commenced in pools, for five matches of round-robin competition, and wrestling to qualify from the championship rounds on Saturday. 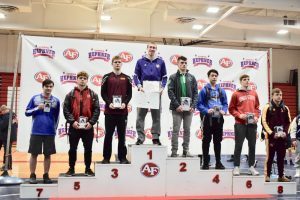 Seniors Paul Twarog and Matt Casey; Juniors, Bradey Humble, Hunter Kupniewski, and Lazar Gasic; Sophomore, David Miller; and Freshmen, Dominic Mudry, all fought through the talented field of 28 teams to earn a spot atop the podium. As the last major wrestling tournament before post-season, wrestlers aspire to be at or near peak physical, mental and tactical condition. They work through weight management, academic challenges, injury and fatigue, often battling illness and maintaining a strict diet to reach the post season not only in one piece, but in top physical shape. Yearly, this grueling challenge starts in November and continues on through the cold winter months. The Josh Hephner Memorial is a good barometer to measure where teams and individuals stand before the gate of post-season wrestling. The Bears are standing tall and looking to the horizon for more good things to come! Results: 152 lbs. Paul Twarog 1st Place; 220 lbs. Lazar Gasic 3rd Place; 113 lbs. Dominic Mudry 6th Place; 139 lbs. David Miller 6th Place; 160 lbs. Hunter Kupniewski 6th Place; 120 lbs. Bradey Humble 7th Place; 170 lbs. Matthew Casey 8th Place.